Not long ago I went into my metaphysical library and spotted an OBE book I couldn't recall ever reading. It was from 2004, a book called Out-of-Body Exploring by Preston Dennett. I just finished it, and here's my review. First of all, there's a good amount of content. This is not one of those lightweight OBE books. It's 182 pages. The font is a little on the small size, but that's a good thing: there is lots of information packed in, and no wasted space. This goes back to the subject of motivating the subconscious mind. That's why I like to read so many OBE books: it feeds my obsession and keeps my subconscious mind trained on the idea of leaving my body. It really does help, especially for beginners. Dennett gives lots of very short OBE narrations to illustrate the points he makes. It's not only effective at driving his point home, it also brings OBE images to your mind that influence and motivate your subconscious. I really appreciate that, and it's uncommon in the genre. I can't stress this point enough: Reading OBE narrations like this makes you imagine yourself in out-of-body scenarios, and that goes straight to your subconscious mind and helps make OBEs more likely. 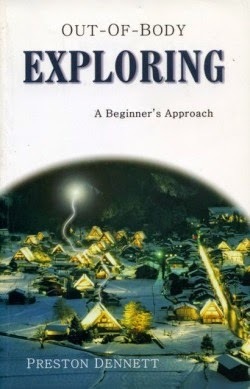 In the beginning, many of his narrations illustrate the same kind of beginner problems I wrote about, like (1) difficulty maintaining lucidity and control, (2) encountering barriers, (3) learning to control emotions, (4) the almost irresistible joy of flying, and so forth. That gave the book a feeling of genuineness. It was quite amusing to hear about his playfully gobbling up astral food or going berserk and destroying things in a grocery store. At least until he learned control. The book has many fascinating experiments, ranging from the simple to the complex. Some of his many experiments include trying to sing, making his astral arms melt away, trying to visit the site of the Titanic, flying to the moon, visiting the Akashic library, time travel, talking to his dead mom, trying to meet God, and many many more. They're all very fascinating. It's not simple wish-fulfillment or fantasy, because most of the experiments yielded unexpected results and in many cases, he did not achieve his goal. One of his experiments had veridical evidence: on page 75, he described flying under a bridge at the L.A. river which has banks lined with concrete. In the out-of-body state, he saw what looked like two feet of dirt lining the banks. After the OBE, he visited the site physically and was shocked to find dirt lining the banks at that exact spot. This seemed to suggest that his OBE was "real" because what he witnessed directly contradicted both his knowledge and his expectations. Also, I like his style. Dennett isn't dictating facts as an expert. He writes like we're all on the same team, and he often quotes several other OBE authors (William Buhlman, Robert Bruce, Sylvan Muldoon, and much to my surprise, even me!) to explain a point. It makes the discussion seem very homogeneous and not self-centered. Dennett gives some very good (but basic) advice for achieving OBEs. He crams it in a bit tight, but it's more than most. He includes several basic foundations (such as relaxation) and techniques found in other books, plus a few of his own tricks, such as "The Flash" where you imagine that you are running extremely fast, like the comic book (& movie) character The Flash. It was solid, although it could have been twice as long. From the office of the grammar Nazi: this book is very well written, clear, concise, and easy to understand. The flow and organization are professional. Its grammar and spelling at both perfect; I did not find one single mistake or typo, and believe me, that's very rare indeed. I really enjoyed this OBE book and give it a big thumbs up. Thanks so much for publishing this book review. I've had the book for some time, but not really read it. I've starting reading it and am enjoying it very much! DISCOVER How You Can Master Your Habits And Reprogram Your Subconscious Mind To Get Any Result You Want In Your Personal Growth and Fulfillment!